I want to start off by saying that I love open world video games. Thanks to services like Steam, I can see just how many hours of my life I have spent playing The Elder Scrolls series or The Forest, and I don’t want to know how many I spent playing Grand Theft Auto (San Andreas to be specific). Open world games connect with me on a strangely personal level, as I imagine they do with others. A lot of people play video games to vent frustrations and pretend they are someone else for a short time, the open world genre allows that to happen with greater depth than others do. You can be whoever you want, and do whatever you like within the framework of a beautifully told story. With some games being so influential that they have dozens of maps and levels designed by the players themselves. However, there is a reason why indie studios don’t make open world games. The same reason a lot of indie games don’t even have multiplayer, because it’s a lot of work and time. Sometimes a designer can prove us wrong (Makers of The Forest, I’m looking at you). But more often than not an indie designed open world game comes up short and is plagued with issues and massive setbacks. Most studios know their limitations and instead focus on narrative driven games that tell a tale, or set a mood rather than attempting something that is a too ambitious. Despite knowing all this I still got excited when I heard about No Mans Sky, I love space and the idea of getting to be a star system hopping pirate temporarily blinded my better judgement. I even pre ordered the game, because I was curious to see what Hello games had created and wanted to experience it right as they released it. And in my opinion, they flew too close to the sun on this one. Here’s why. In its current iteration No Mans Sky is more a proof of concept than it is a full fledged game. Like I had mentioned previously, it takes a lot of time and money to make a game of this size. AAA studios with hundreds of programmers working around the clock struggle to get games like this out in less than a few years. So you can imagine how long it would take for a few dozen designers, this problem is amplified when you need to figure out how to pay them. I knew there were issues when they postponed the launch by a few months. The timeframe wasn’t enough to solve anything that would make the game unplayable. If they were really spending time fixing something, they would have solved the fact that the pre order ship stranded you in the second star system. The game feels empty, lonely. Which I understand is a selling point of sorts, but only if the effect is intended. Instead No Mans Sky just feels repetitive and sparse, you complete the same basic tasks over and over again. It makes sense that this game takes place in a science based universe, because there is very little magic to be found. Think of the games you played most when you were younger, I bet they were either insanely difficult, or open world. By comparison, most open world games are a fraction of the size of No Mans Sky, which was another of its selling points. Yet those games have much more to discover, unlock and achieve. When it comes to a game world it’s not about size, but density. It’s about the joy of discovering new and wonderful things in a thematic universe, of designing your character and laying the framework for an epic adventure. There are Final Fantasy games out there that we are still discovering items and objectives in, a decade later. And while I am sure we will still be discovering planets for quite a long time in No Mans Sky, they are all inherently the same. Procedurally generated, template based worlds that take the fun of discovery away. Defeating the whole purpose in the first place. Nothing about the game makes me want to explore, because I know I am not going to stumble upon a beautifully designed hidden cave, temple, item or NPC. After about twenty minutes of playing you realize that the interactive parts of the game are all contained within very specified areas, that are marked for you. As such No Mans Sky becomes functionally much smaller than other games because you won’t end up exploring the entirety of every planet. To a lot of people, the driving force behind playing an open world game is the ability to choose who you are. And have your character either mirror, or totally reject the virtues you embody as a human being. In other games things like armour, weaponry, karma, fighting style, factions, dialogue choices, appearance, power ups, special abilities, crafting, selectable quests, skills and races help you hone down who your character is, so that you can mentally tell a better story and play how you want. Despite it being advertised as such, No Mans Sky really doesn’t have any of that. You’re a faceless character who encounters generic “Star-Trek” like aliens. The stat balance of weapons and ships is poor as well, there is always one clear winner whenever you’re given a choice. And you would be remiss if you don’t choose that, regardless what type of player you’re attempting to be. There has been a recent rash of people who have demanded their money back for purchasing No Mans Sky, and while that is a bit of an extreme reaction, I don’t necessarily disagree with it. Personally I am keeping the game, but still writing this because I think it is important for game designers to be held accountable for their actions and creations. Games don’t cost $10 anymore. They are a real expense, and one that we want to get our moneys worth from. If you can’t deliver what you promised, make different games, that are within your financial and technical ability. 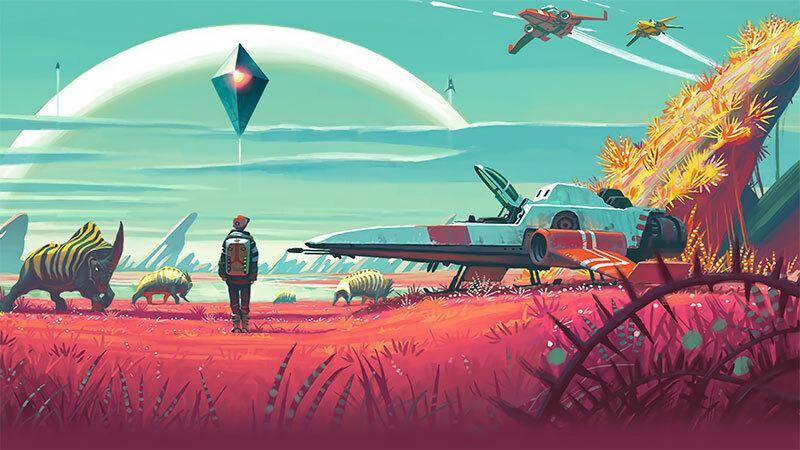 I am hopeful that Hello games will devote themselves to fixing and adding the depth required to make No Mans Sky truly great, and that with time we will have the game we were promised.